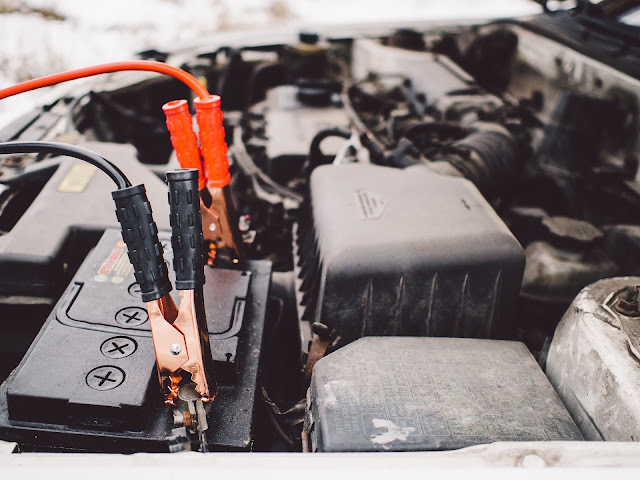 It’s that time of the year again when the cold winter weather can easily kill your vehicle battery. Each year people are injured from attempting to jump start a vehicle incorrectly. It’s important to know the steps to properly jump start a vehicle either with cables and another vehicle or with a jump pack. First, let’s walk through the steps of SAFELY jumpstarting a vehicle with cables and another vehicle. If possible, try to park the front bumper of the operable vehicle just over a foot away from the front bumper of the “dead” vehicle. Make sure that both cars are shut off, with the parking breaks on so that neither of the vehicles can move. Open the hood of each vehicle and identify the positive and negative terminals on each of the two batteries. The positive terminal can be identified by red coloring and/or a “+” sign, where the negative terminal is identified by black coloring and/or a “-“ sign. Your cables should also be colored red, and black to match the positive and negative terminals. You’ll want to start by attaching the positive cable to the positive terminal of the “dead” battery, and then attach the other clamp of the positive cable to the positive terminal of the operable “good” battery. Next, attach one of the clamps of the negative cable to the terminal of the operable “good” battery, and attach the final clamp of the negative cable to an unpainted metal surface on your vehicle that is not near the battery. Be cautious of belts, pulleys and other moving parts. Keep other people and hands away from the vehicles to keep everyone safe. Start the engine of the operable vehicle and allow it to run for 1-2 minutes before stepping on the gas gently to rev the engine slightly and help charge the battery of the “dead” vehicle. Once the “dead” vehicle is started you will need to take it for a short drive to help charge the battery. (Driving your vehicle builds up a charge in its battery). When you return from your drive ensure that all lights are shut off – to prevent the battery from draining again. The process for a jump pack is quite similar to that of jumpstarting a vehicle with cables and another vehicle. Essentially, the jump pack takes the place of the other ends of both the positive and negative cables and clamps, and the “good” vehicle. With a fully charged jump pack, open the hood of the “dead” vehicle and locate the positive and negative terminals of the battery. Attach the red (positive) cable to the positive terminal of the battery, then attach the black (negative) cable to the negative terminal of the battery. Store the jump pack safely in your vehicle until you can return it home to charge again. Once the “dead” vehicle is started you will need to take it for a short drive to help charge the better. (Driving your vehicle builds up a charge in its battery). When you return from your drive ensure that all lights are shut off to prevent the battery from draining again. These simple steps might seem like common sense, but one minor slip up could result in injuries, and possible damage to your vehicle. For more safety tips keep reading our blog!